Reyna González, is a specialist in non-profit organizational management and popular education methodology. She has more than 20 years of experience as an educator, administrator and consultant. Her areas of expertise include, among other areas, strategic planning, leadership training, especially for youth, as well as program development and evaluation. 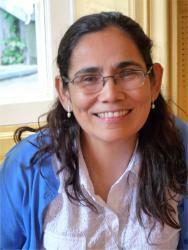 She serves as Co-coordinator of the Continental Popular Education Network of Sacred Heart. She leads several youth oriented projects including the Summit Leadership Academy, border immersion programs and is the creator of the Call Me Back app, a tool for discernment and life exploration for young adults. She is Spanish-English bi-lingual.